Pumpkin pie bark makes a chewy and nutritious trail snack or turns into no-crust pumpkin pie or pudding with the addition of water. As a snack, it goes in like a chip and down like pie. 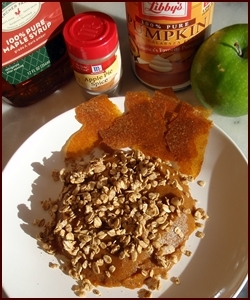 Combine pumpkin with maple syrup and pumpkin pie spice. Use real maple syrup for best results. Stir until ingredients are mixed well. You don't need to use a blender. Spread thinly (about eighth inch) on dehydrator trays covered with Excalibur Paraflexx® sheets, parchment paper, or the fruit leather inserts that go with your dehydrator. Dehydrate at 135° for eight hours until brittle. After about five hours, flip the bark over as follows: Place a spare dehydrator tray on top of the Bark and flip the two trays over so that the bottom side of the bark is now facing up. This will ensure complete drying. 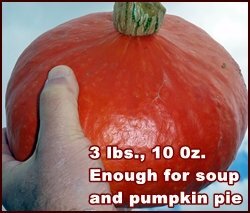 Yield: One 15 ounce can of pumpkin barks down to 1½ cups weighing four ounces. Pumpkin Pie Bark dissolves in hot or cold water. If you want hot pie or pudding, stir the Bark with hot water until creamy. I use my candle stove to gently warm the water for pumpkin pie. I eat it like pudding, but the photo shows that it is thick enough to shape into a wedge of pie. For larger servings, combine with an equal quantity of water. Garnish with chopped walnuts or pecans if desired. Tip: Excalibur dehydrators have 15 X 15 inch square trays which makes it much easier to spread liquified foods compared to round dehydrators with holes in the middle of the trays. Read more about Excalibur Dehydrators. Peel and core apple and cut into pieces. Combine with pumpkin and spices in blender and blend until smooth. Spread thinly on dehydrator trays covered with paraflexx® sheets or parchment paper. Dehydrate at 135° for eight hours. Employ the flip trick as discussed above after five hours. Dried consistency will be more leathery than basic pumpkin pie bark which is brittle. Tear bark into pieces and enjoy as a trail snack. To make pie or pudding, combine ½ cup bark with ½ cup hot water and stir until creamy. I like this dessert garnished with granola. You can also dehydrate fresh pumpkin and turn it into soup, mashed pumpkin and pie. I cover the topic in a back issue of my free newsletter, Trail Bytes. Click to read it: How to make pumpkin pie bark with a whole pumpkin. 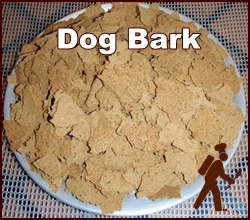 If you travel with a dog, try making dog bark... they love it. It's a very healthy treat with ground beef, sweet potatoes and green beans. Potato Bark, Sweet Potato Bark, Bean Bark, Corn Bark and more! Dehydrating Vegetables, Fruit, Meat, Sauce, Bark, Leather, Soup, Vacuum Sealing and more! Grahma Nanna Nilla Pudding, Pineapple Upside Down Cake and more!